Dr Barry Quinn started his career in healthcare in 1985, volunteering in a hospice as a healthcare assistant. He was ordained as a priest and worked as chaplain to a hospice for several years. After leaving the priesthood he entered nursing in 1991. 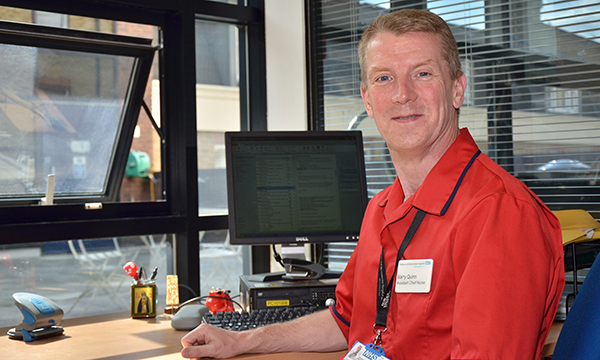 He has worked in cancer and palliative care for more than 30 years in hospice and hospital settings, and his previous roles include lead nurse for cancer and palliative care, consultant nurse and assistant director of nursing. He took up his current role as Macmillan director of nursing and cancer and palliative care at Bart’s Health NHS Trust in London in April, a post he holds alongside his role as a senior lecturer at King’s College London. He is also chair of the European Oral Care in Cancer Group and is consultant editor of the RCNi journal Nursing Management. The trust has four hospital sites with more than 16,000 staff. My role involves supporting and developing staff and services and ensuring we respond and attend to the needs of people with cancer and their families, and those with advanced disease. Throughout my 30-year nursing career I have developed clinical, leadership, academic and research skills. But perhaps the most important factor in getting this job was learning from the people I care for and the staff I lead and work with, alongside experience and training opportunities. People with cancer and their families, from diagnosis to treatment and recovery, and those with advanced disease. Without a doubt the people I am privileged to nurse. In the changing healthcare environment we can lose sight of the value of nursing and nursing leadership, what nursing as a profession brings to the healthcare discussion and how each nursing encounter can make a difference. The person with illness and their family, followed closely by the colleagues I am privileged to lead. Through my own experience of the ups and downs of life, the people I have met and the nursing opportunities I have been involved with. Taking the time to listen to the personal stories of those I have met, getting a glimpse of the person behind or beyond the illness. I enjoyed my time as a priest but I enjoy the freedom that comes with being a nurse. I enjoy my current role and it is important for me to have a good work-life balance. As I get older any career move will reflect that. That there are some great and dedicated colleagues and there are other colleagues that I would prefer to give a wide margin to. When I was in my early twenties a wise person told me to enjoy the journey and be less focused on the destination. This has helped me greatly. What kind of leader do we want in nursing?